(COMMENTARY) With just seconds left on the clock, Seton Hall star Myles Powell missed a 3-pointer that could have won them the game and the Big East Tournament. Instead, the sold-out crowd of 19,812 at Madison Square Garden in New York watched with elation and shock on Saturday night as defending national champion Villanova celebrated its third straight conference title. Whether Villanova can once again lift the title remains to be seen. Which school will be crowned the nation’s top men’s basketball team is a question as ubiquitous every spring as office workers dragging down productivity as a result of watching March Madness. If the past is any gauge, the odds are very good that several Catholic institutions of higher learning, like Villanova, will emerge as contenders over the next few weeks. For Wright and his team, God does play a big role in everything they do. The phenomenon of Catholic schools achieving success in Division I men’s basketball dates back decades. Throughout the 1940s and ‘50s, teams like Holy Cross, University of San Francisco and La Salle captured titles. Marquette eventually emerged as a powerhouse in the years stretching from the late 1960s and early ‘70s. The 1980s brought with it the emergence of the Big East. The 1985 Final Four, for example, featured three Catholic schools (St. John’s, Georgetown and Villanova) and eventually won by the Wildcats. In recent years, Gonzaga had an extraordinary run that includes 21 straight tournament appearances and finishing runners up in the 2017 championship game. “Catholic schools originated in or near urban areas and were able to tap into immigrant communities — largely Catholic and Jewish — that could participate in basketball more than in other organized sports,” said Rick Eckstein, a sociology professor at Villanova. 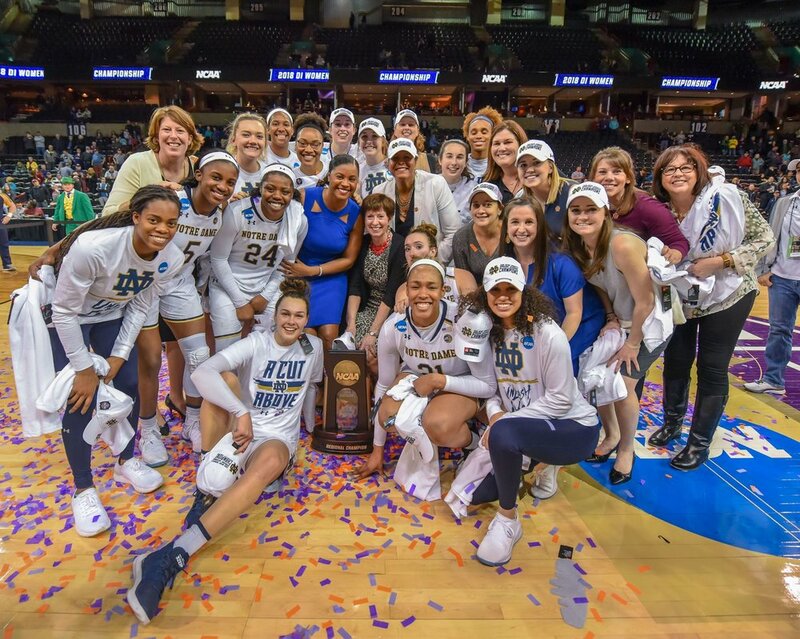 While Villanova captured last year’s men’s title, Notre Dame, a private Catholic university based in Indiana, dominated women’s hoops and were crowned national champions at the same time. Notre Dame is affiliated with the Congregation of Holy Cross, a religious order of priests founded in France. The success Catholic colleges and universities have had during March Madness, which starts Tuesday with the First Four, doesn’t appear to be subsiding anytime soon. While Catholic success on the collegiate level regarding men’s and women’s hoops may be a real thing, it doesn’t always translate to the larger sports landscape. Eckstein said most Catholic colleges fail to excel at football. For example, of the 65 schools that make up the nation’s five football power conferences, only two schools — Notre Dame and Boston College — are Roman Catholic. Football has always been largely the domain of state schools and mainline Protestant colleges. Eckstein said the Catholic Youth Organization was once responsible for helping the urban poor play basketball in church gyms. It was only a few decades ago that Catholics lived primarily in urban areas — cities such as New York, Philadelphia and Chicago — and those same Irish and Italian immigrants were unable to get into most universities. Over time, these same schools became a magnet for African-American players. Of the 68 teams (counting the four who have to play play-in games) competing in the tournament this year, there are several contenders among the Catholic colleges. Aside from Villanova, there’s Gonzaga, a Jesuit-run school based in Spokane in Washington state that a No, 1 seed. The Jesuits, it’s worth noting, are particularly fond of their basketball tradition, even sparking #JesuitEducated to become a thing on Twitter. Among the potential Cinderella teams, look no further than two No. 11 seeds: St. Mary’s College in California, run by the De La Salle Christian Brothers, and St. John’s University, run by the Vincentian Fathers, in New York City. Religious rituals remain as fundamental to some of these schools as layups and free throws. The Rev. Rob Hagan, a priest who serves as Villanova’s basketball team chaplain, leads the players in prayer at meals on game days, in the locker room before tipoff and after each contest. The players all participate, despite hailing from various faith traditions outside Catholicism. Last year marked an epic season for Catholic schools. With the Final Four coinciding with Easter weekend, sports and religion collided. As a result, not only did Villanova win the title, but half of the tournament’s Elite Eight featured a Catholic school. My personal favorite was the endearing 98-year-old nun named Jean Dolores Schmidt, who served as chaplain for the men’s basketball team from Loyola University-Chicago. Schmidt, who encouraged the players from the sidelines, was featured on everything from posters and bobblehead dolls and always there for all the Ramblers’ games — even when the team’s Cinderella run came to a sad end in the semifinals against Michigan. The victories for Villanova and Notre Dame, meanwhile, were not a first for either team — but a first for two Catholic university teams to win championships in the same year, according to the Association of Catholic Colleges and Universities. Who will emerge as this year’s champion? The bracket-busting upsets and dramatic 3-pointers with time running out will once again dominate out time and many of the 67 games jammed into a period of just 19 days. Let the madness begin!